This article uncovers the factors that have contributed to the lack of commensurate success in the anaemia reduction efforts despite government�s persistent and prolonged efforts to combat anaemia. It uncovers the key issues based on primary and secondary research. It also makes some policy level recommendations on how these factors could be overcome and recommendations incorporated into the government programmes to make anaemia eradication more successful. In-depth interviews were conducted with all stakeholders in this programme, namely, doctors, hospital staff, Auxiliary Nurse Midwives (ANMs), Asha workers, pregnant and lactating mothers and adolescent girls. The Iron & Folic Acid Program (IFA) introduced by the government in the 80s has been underway for more than 25 years now. It is aimed at reducing the levels of anaemia among pregnant and lactating women; and children. The program is primarily prophylactic & not therapeutic (aimed to prevent, not to cure) and most of the health units are equipped only for the former kind of treatment. Both the Central & the State Governments are involved in this scheme. While the Central Government is involved in the procurement of the medicines, the State Government is involved in the distribution to the various health units across the state. Distribution of medicine in the rural areas is done through multiple mediums. Young children below the age of 4 get the dose from the Anganwadi, a government sponsored child & mother care center. The school going children are provided iron & folic acid tablets in schools during the mid-day meals provided by the government. Adolescent girls and pregnant & lactating women are provided iron & folic acid tablets through the network of health care units spread across the state. Exhibit 1 gives a brief about more recent initiatives taken by government. However, all the programs have some lacunae in meeting the desired objective. 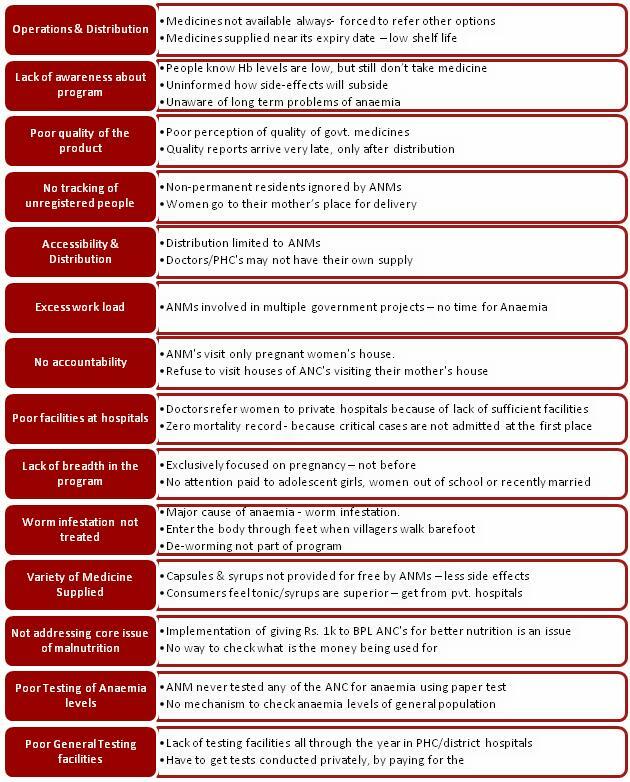 Exhibit 2 talks about more specific initiatives the government has taken for pre and post natal care of women. The next section gives a summary of the major problems that are plaguing the program and hindering its implementation. Lack of focus on the underlying cause and prevention: The key causes of anaemia are malnutrition and worm infestation. Both of these are not directly addressed in the program. Lack of breadth in the program: The program is exclusively focused on pregnant women and school children. It does not take into consideration children below 5 years, adolescent girls, women out of school or recently married women. There is no focus on un-registered and non-permanent residents either. Lack of widespread awareness and education: Lack of awareness about causes and implications of anaemia. No information about expected side-effects and how to mitigate them is provided. No proper maternal transfer system across locations: Anti-Natal Care (ANC) moving to maternal house during pregnancy are not well accounted for and not visited by the local Auxiliary Nurse Midwife (ANM) or provided free medicines. Quality and Variety of Medicine: The tablets provided have various side effects like red stools, stomach discomfort. Capsules and syrups have fewer side-effects but are not provided for free. Public perception of quality of medicines provided by government is poor. Lack of Monitoring mechanism: There is no monitoring of the work of the ANMs who are supposed to visit every house. ANMs were found to only visit houses of pregnant women who stay there permanently. ANMs were expected to conducted check for Anaemia using paper tests which they did not conduct. Poor testing and treatment facilities at hospitals: Lack of testing and delivery facilities at hospitals. All critical delivery cases are referred to private hospitals, thus providing hospitals with an unrealistic clean slate. There is no mechanism to test anaemia levels of general population. Poor distribution of medicines: No common distribution route for medicines for ANMs and doctors is available. Medicine supply is not regular and cases of stock-outs are quite prevalent. Medicines are not distributed in a timely fashion leading often to the delivery of almost expired medicines. The details of all the problems that were identified are included in Exhibit 3. Using various popular mediums of communication like television, poster campaign, street plays, comic strips etc. for greater awareness about causes, consequences, prevention and treatment of anaemia. The role of a balanced diet in preventing several diseases including anaemia should be emphasised. Star endorsement and brand personification to appeal to both male and female audiences. Efficient implementation of additional initiatives like de-worming, card transfer for moving pregnant women, supply of folic acid tablets from 1st month of pregnancy. Improving the medicine supply through public private partnership and making private party responsible for maintaining minimum requirement levels at all districts. Enhancing the infrastructure and leveraging the Information Technology and mobile network to reach out to women at all stages of pregnancy. Providing continuous monitoring to these women. Extending the reach of Anganwadis to backward regions through collaboration with Non-Governmental Organisations. Building a strong system beginning from training and educating ANMs & school teachers, and mobilizing them to enable greater awareness and better implementation of programs. Developing a strong feedback and evaluation mechanism for efficient monitoring. Exhibit 4 has the summary of all the recommendations classified by quick fix, short term and long term recommendations. Despite huge efforts of the government and several National Rural Health Mission (NRHM) initiatives over the last 25 years the problem of anaemia is very severe. There are several operational and implementation issues that have plagued the program. The primary cause for concern is the lack of a strong feedback and process enhancements procedure. There is no proper mechanism for monitoring the implementation or collection of feedback from the grass roots level. The report proposes certain policy level changes that should be brought in, along with a new implementation strategy to increase awareness and to bring accountability into the system. 1 National Family Health Survey (NFHS-3), 2005-2006,http://www.nfhsindia.org/pdf/India.pdf, last accessed on January 7, 2010. 2 Professor Suneeta Mittal, 12 by 12 Initiative, http://www.12by12initiative.com/preface.asp, last accessed on January 7, 2010. 3 Unicef Statistics, http://www.unicef.org/infobycountry/india_statistics.html, last accessed on January 7, 2010.